Venus Smileygal: Kasalan sa Kagay-an 2009! 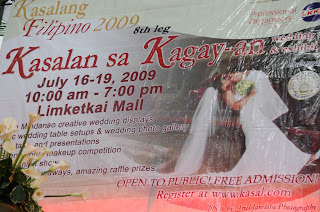 It was really sad that I haven't visited the Kasalan sa Kagay-an Event last July 16-19, 2009 held at Rotunda area of Limketkai Mall. The nationwide wedding fair road show presented by Kasal.com, ABS-CBN Regional Network Group, Professional Organizers Unlimited Inc. and Limketkai Sons, Inc. was the 8th leg of Kasalang Filipino 2009. This roadshow will also be in 11 cities San Pablo, Tagaytay, Tarlac, Dagupan, Legazpi, Dumaguete, General Santos, Davao, Bacolod, Manila, and Cebu. Admission is free. Creative, unique wedding supplies & displays. Wedding fashion show,“Down the Aisle in Style,” featuring Cagayan de Oro's local bridal couturiers. Photos credits to Irene and Mark. There are many wedding photographers also attended in the event and distributed leaflets, flyers and business cards. One of them is a CDO-based group composed of professional videographers and professional photographers called Team Oro. I actually met one of their members Bon Aserios during our CDO bloggers meeting. Bon is a graphic artist and caricaturist one of his works is the popular avatar of Chiq Montes. For contacts visit: www.bonaserios.com. You could also contact him at this number 09274720923 or email bonaserios(@)yahoo.com.